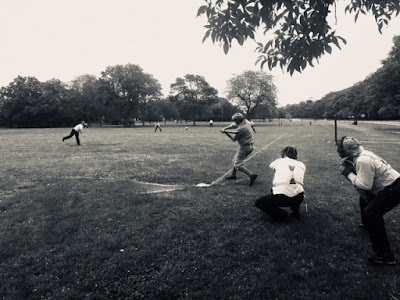 PISCATAWAY, N.J. -- The Providence Grays vintage base ball club (10-4) traveled to the New York region for four games over two days this past weekend, beginning with a doubleheader against the Brooklyn Atlantics (14-2) at the Smithtown Historical Society (Smithtown, N.Y.) in honor of Old Dutch Day (Jun. 9). Game one (1864 rules) was a neck-and-neck affair that saw a late Grays' rally come up short as they fell 9-7. 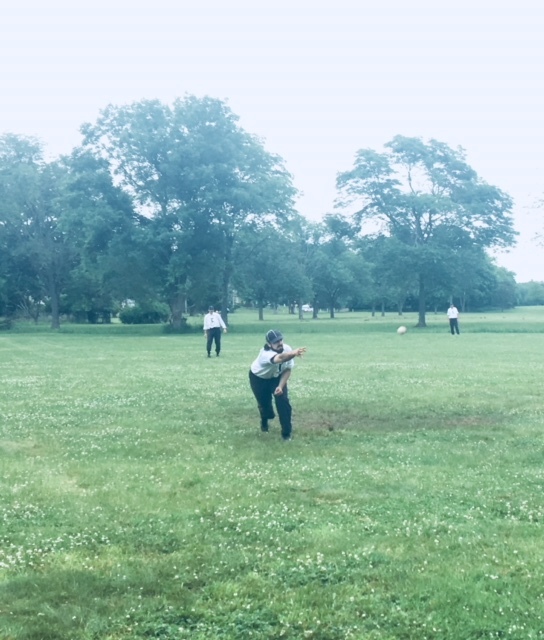 The second outing (1884 rules) was well contested, but two big innings for Brooklyn gave them a 19-11 victory. 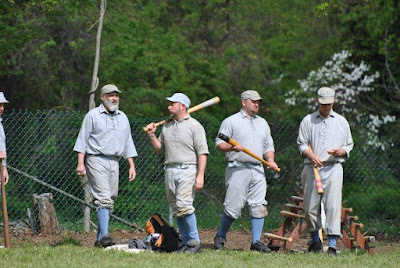 On Sunday, the Grays crossed the rivers to take on the New Brunswick Liberty (6-4) at the East Jersey Old Town Village (Piscataway, N.J.) for yet another twin bill. The first match-up (1884 rules) featured plenty of early offense for Providence which was enough to give them a 19-8 win. Game two (1858 rules) was the other way around, as New Brunswick got ahead in the early going and never relinquished their lead for a 20-11 triumph. The Grays jumped out to a 1-0 lead in game one against the Atlantics after the top of the first, but the hosts put up two of their own to lead 2-1 after one. Neither side mustered much offense for the next few innings as hurler Jon "Bones" Henson and the defense behind him limited Brooklyn early on. Captain Brian Travers drove in Providence's second run of the game in the third as his squad trailed 4-2 after four frames. A three-run fifth, led by knocks from Travers and Jerry McCormack, had the Grays up 5-4 after four and a half, but a four-run eighth for Brooklyn would go on to seal the victory. Game two on Saturday was low-scoring early on, but spotty Grays' defense and timely Brooklyn hits gave them a 9-4 advantage in the middle innings. Providence fought back, however, making it 9-8 after a Kai Henson RBI single. Another shaky defensive frame mixed with well-placed hitting opened things up for the Atlantics, and they went on to win 19-11. For Brooklyn, pitcher Frank "Shakespeare" Van Zant went eight strong innings and earned his team's 14th victory of the season. Providence bounced back nicely in the first game versus the Liberty, scoring 10 runs in the top of the first as Travers, Kai Henson, and short stop Mike Duggan all scored twice in the frame. They tallied five more in the second, but a seven-run bottom half for New Brunswick brought them back within striking distance. However, three scores in the fourth behind an RBI single from third baseman Greg Smith secured victory for the Grays. Sunday's second game saw an immense turnaround, as the Liberty notched 10 runs in their first inning to take immediate control. New Brunswick led 14-6 after four, but Providence responded with three tallies in the fifth behind singles from Smith, Duggan, and left fielder Johnny Carlevale. The Liberty didn't waver as they held the Grays scoreless for the next two innings while padding their lead with three in the sixth and another in the seventh. The Grays would strand a runner at third in the bottom of the ninth as they finished the weekend 1-3. Next up for Providence is a pair of underhand contests against the Bristol Blues at the Bristol Town Common (Bristol, R.I.) on Saturday, June 16, with first pitch set for noon.